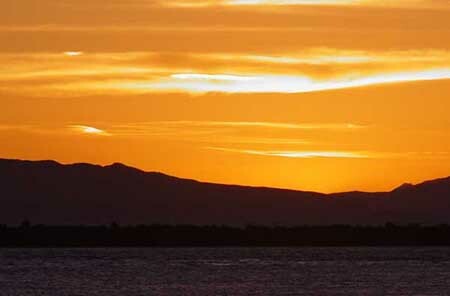 Good morning from Oxnard Harbor. We left home about 7:30. When we left the temperature in the motorhome was 46. It is only 5 miles to get here, so it is a quick trip. We stopped at the donut shop on the way to get a couple sweet rolls to go with breakfast. They have the best coffee there, so I got a cup. Sharon does not drink coffee. 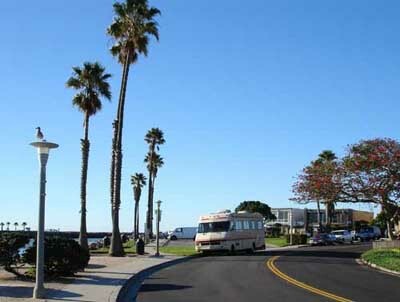 We are now parked at the harbor's edge diagonally across from the Coast Guard Station. It is a bright sunny morning. A really beautiful day to spend here at the harbor. After breakfast of bacon, eggs and sweet rolls we will take a short walk. There is grass, benches and picnic tables here. It isn't quite a park, but is nice nice place to park and watch boats going in and out of the harbor. This is a good idea. Getting away for a day trip in the motorhome. It gets us out and parked at a great place to watch boats and people. We do not get out enough. I think this should become at least a once a week thing. Get up, throw a couple things in the motorhome and take off for the day. Another good thing is that since we are in the motorhome, it compels us to stay longer. We have the pleasure of an outing and all the conveniences of home right here. We have a number of interesting places we can go for day trips. Most involve the beach and the ocean. All are within 20 miles of home. I can work or relax since what I do now is all done on a computer. With internet access, I can do almost anything I can do at the office. One thing I really need to do is create a computer work station in the motorhome. Working at the dinette is not ideal. Just about the time I get going a meal is ready and I have to move the computer and paper notebooks somewhere else. I think I can turn the small table behind the passenger seat into a computer work station if I get creative. The table would have to be lowered to make it more comfortable for typing. I would have to get 12 volt power for my external LCD monitor. Right now, across the harbor are a group of kayakers in ocean going kayaks. It must be a kayak club. Kayaking is very popular in the harbor and out on the ocean. We often see kayakers about 1/2 mile offshore. A commercial fishing boat is leaving the harbor right now. Just before that a couple of sail boats left. There goes a charter fishing boat with fishermen lined up on the deck. They will probably go out about 11 miles to the off shore islands. The harbor is busy. A whale watching boat is going out. It is large like a charter fishing boat. There were not a lot of people on the trip. Lots of room on deck. Just off the coast and on the other side of the islands is the whale migration path. The boat that just went out is one we have been whale watching on a couple times. We left the tiny park area and drove about a mile down to the Farmer's Market. All we bought today was fresh, locally grown strawberries. Our strawberry season is 12 months long. Since the Farmer's Market is in the harbor area, there is a "farmer" selling his crop from his boat. He sells fresh fish, crab and lobster. Orchid plants are sold here too. 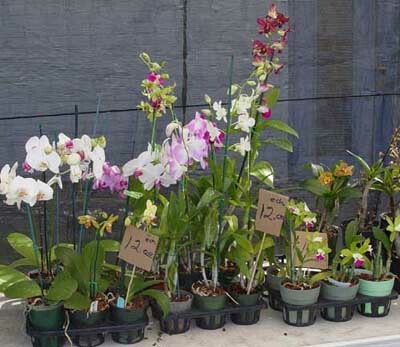 This is an ideal place if you want to grow orchids at home. I'll post pictures later, but for now, a potted blooming orchid costs $12 here at the Farmer's Market. Because of our long growing season, there are many locally grown crops include beautiful flowers.